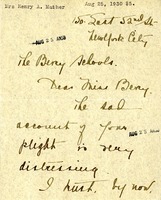 Letter to Mary Ricketts from The Berry Schools, Inc. 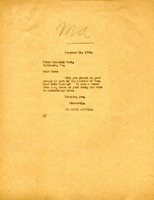 The Berry Schools request that Mrs. Ricketts send them an updated address so she may receive the school's publications. A return message from Mrs. Ricketts notes the correct address. The Berry Schools request Dr. Kellogg at the Battle Creek Sanitarium send an address as soon as possible. 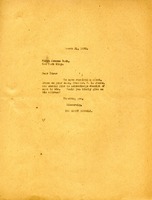 Mr. Guold writes to the Berry Schools with an address for Mr. Robert O'Connor. 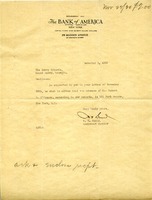 This letter corrects a mistake from an earlier letter and asks for the address for Mr. Robt. 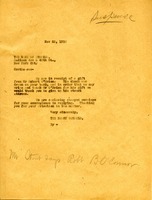 B. O'Connor. The Berry schools are requesting the address of Mr. Robert O'Brien so they can write and thank him for his gift. 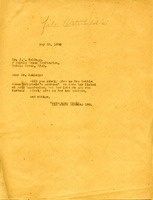 The address of Mrs. Miller is given. Mrs. Mather sends Martha Berry a $5.00 donation and lets her know that she will be going away for quite some time, so she is not sure if she will be able to help much. The Berry Schools are enquiring about the address of Miss Hondt. 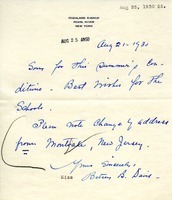 A card giving the address of Miss Davis. 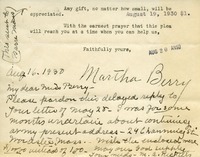 Mrs. Davis updates her address for Martha Berry's records. 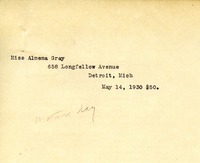 Miss Davis sends Martha Berry her new address.